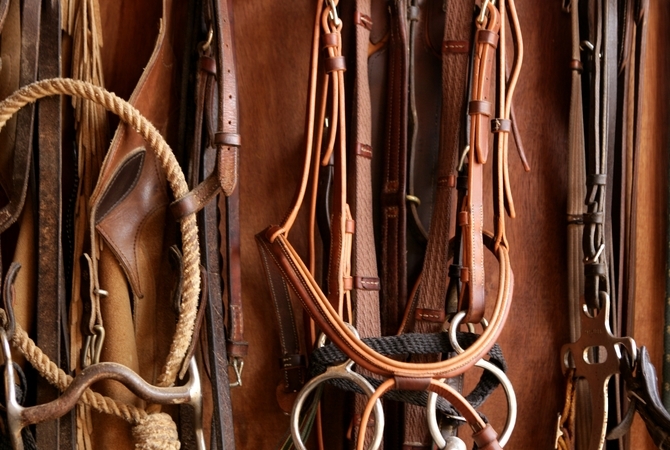 Tack for horses including bridles and a rope that could be used to hobble a horse. Hobbling is the act of tying two of the horse's legs together with a short length of rope or leather to impede forward movement. Hobbles are used by trail riders who want their horses to stay put close to camp, trainers who want their horses to learn to stand still or not struggle against pressure on their legs and by many horse owners who want their horses to have the self discipline that comes with the experience of having leg and foot movement restricted. Gently touching and rubbing the horse's lower legs and feet without the horse flinching or moving away is the first step toward successfully training the horse to accept hobbles. The use of hobbles has been around since man began to domesticate animals. Tying two legs together to prevent running away has definite benefits both for the horse and the owner/rider. When it comes to horses, acceptance of the hobble not only teaches the horse patience and to remain in one place, but it also can quite literally save a horse's limb or life if the horse becomes caught in a barbed wire fence or other situation where too much movement may cause disastrous damage. When a horse understands restraints and yielding to pressure rather than resisting and pulling against it, he might survive a life or limb-threatening experience. In addition, teaching your horse to accept being hobbled has advantages when you are unable to tie or restrain your horse in other ways such as when you are out on a treeless trail. According to Rick Gore, founder of Think Like A Horse, "Hobble training your horse will teach him patience, will teach him to give to pressure, will teach him not to panic if his legs are trapped, and it comes in handy if you have no place to tie." In the past, hobbles were often used on horses in cruel ways to break their spirit, to take the fight out of a horse, and/or to dominate the horse. More recently horse owners and trainers have realized that that training a horse to accept hobbles is a way to safely give a horse a certain amount of freedom while leaving the horse free to defend itself if necessary, keeping the horse within in a certain area, and teaching him not to panic when his legs are trapped. Work on hobble training in a safe enclosed space with soft level footing and no obstacles. Start hobbling lessons when your horse is tired rather than fresh. Take things slowly and include every step for safety and acceptance. Make sure your horse is physically fit, so he's less likely to incur injury. Stay alert and out of harm's way as your horse adapts to the hobbles. Keep a pocket knife handy in case of emergency; use it only if you can do so without endangering yourself. When training a horse to accept hobbles, a chance exists for injury to both horse and trainer. Be sure to stay alert, since some horses will loose their balance and might fall over or jump or rear when they discover their feet are tied. Handling the feet and lower limbs is an important part of training a horse. If a foal is used to having its feet and lower legs touched and handled, it carries over throughout the horse's life. If not trained as a foal, an older horse can be taught to accept handling of feet and lower limbs by gentle use of a training stick, a soft cotton rope, pieces of cloth, brushing and the use of sprayed water to get the horse used to having feet and lower legs touched and handled. 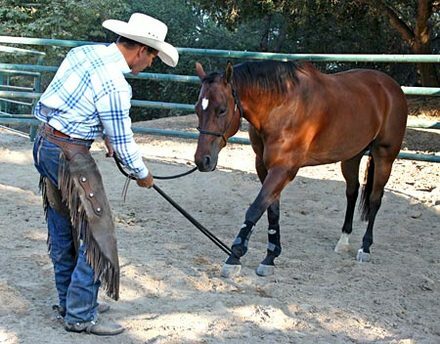 Using a soft cotton rope, put the rope first on one leg and then another, teaching the horse to cooperate when pressure is applied by lifting his hoof. Once the horse lifts the hoof, relax the pressure. Soon, you will be able to move the horse by attaching the rope to any foot. By tying a soft rope around his girth and leading him with gentle pressure, the horse becomes used to pressure while remaining comfortable and cooperative. The best and most comfortable hobbles for horses are made of leather, woven nylon and neoprene. Because of the horse's strength, they should be strong and should be adjusted to fit the horse properly. With the horse in an enclosed paddock or corral area with soft dirt or grass underfoot, apply hobbles made of soft rope, soft leather or other soft, strong material. Never use chains since they can be frightening and cause damage to the horse's legs. Most horses will struggle when first feeling the effects of the hobbles. Once the horse struggles a bit, he will usually stop and stand still looking to you for help if you have desensitized their lower limbs and feet sufficiently. As soon as the horse stands still, you calmly take the hobbles off, reassure the horse and then have him slowly walk off a few steps. Repeat hobbling your horse for short periods of time until he calmly accepts the pressure and lowered mobility of being hobbled. Always be calm and patient when hobbling your horse. As the herd leader, it is your job to show him that it is no big deal - just another experience in the daily life of horse and herd leader. Once your horse begins to accept being hobbled, make it a practice to hobble him for short periods of time while he is grazing, out on the trail, getting ready for grooming or a visit from the farrier or veterinarian. This practice will add another dimension to your relationship with your horse, and who knows, may save the horse's limb or life if ever he becomes entwined in barbed wire or another situation where yielding to pressure prevents injury or harm. Horses that have had their coordination or balance compromised by sedation, or horses that are suffering from neurological disorders should not be hobbled. Hobbles should not be used to restrain a horse during a painful procedure. Hobbles are effective restraint for addressing an emergency and training a horse to stand still and accept pressure, but should never be used to restrain a horse in place of providing pain management. Hobbles should never be placed on a joint or placed on so tight as to restrict blood flow.